A magnificent proliferation of new Christ-centered devotional practices—including affective meditation, imitative suffering, crusade, Eucharistic cults and miracles, passion drama, and liturgical performance—reveals profound changes in the Western Christian temperament of the twelfth century and beyond. This change has often been attributed by scholars to an increasing emphasis on God's embodiment in the incarnation and crucifixion of Christ. In Holy Matter, Sara Ritchey offers a fresh narrative explaining theological and devotional change by journeying beyond the human body to ask how religious men and women understood the effects of God’s incarnation on the natural, material world. She finds a remarkable willingness on the part of medieval Christians to embrace the material world—its trees, flowers, vines, its worms and wolves—as a locus for divine encounter. Early signs that perceptions of the material world were shifting can be seen in reformed communities of religious women in the twelfth-century Rhineland. 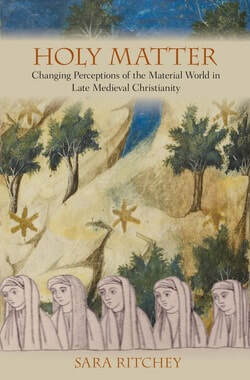 Here Ritchey finds that, in response to the constraints of gendered regulations and spiritual ideals, women created new identities as virgins who, like the mother of Christ, impelled the world’s re-creation—their notion of the world’s re-creation held that God created the world a second time when Christ was born. In this second act of creation God was seen to be present in the physical world, thus making matter holy. Ritchey then traces the diffusion of this new religious doctrine beyond the Rhineland, showing the profound impact it had on both women and men in professed religious life, especially Franciscans in Italy and Carthusians in England. Drawing on a wide range of sources including art, liturgy, prayer, poetry, meditative guides, and treatises of spiritual instruction, Holy Matter reveals an important transformation in late medieval devotional practice, a shift from metaphor to material, from gazing on images of a God made visible in the splendor of natural beauty to looking at the natural world itself, and finding there God’s presence and promise of salvation.